Congratulations to Jungwoo Shin, winner of the Racheff-Intel award (2018)! The award consists of a plaque and up to $1,000 financial support to attend a conference at which the student will present the relevant research. 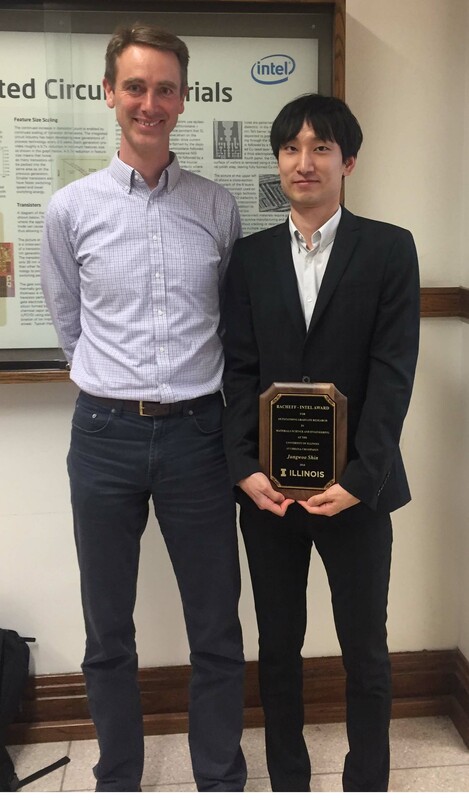 Jungwoo also received the Dow Chemical Best Presentation Gold Award in Soft Materials (2018) for the combined research presentation with liquid crystal polymer and the azopolymer works. 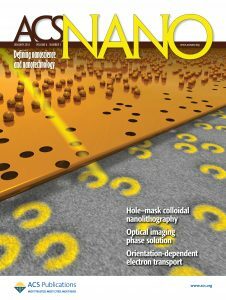 Braun group research from January 2008 is featured on the celebratory cover for the tenth anniversary of the launch of Nature Photonics. Nickel inverse opal forms one of the two phases of a battery cathode. Together with an electrochemically active phase, this electrode architecture allows for a rapid ion and electron exchange and transport for fast recharging batteries. Many news agencies highlight our work on bioresorbable silicon electronic interfaces to the brain, published in Nature; CNN, IEEE Spectrum, Discover, New Scientist, United Press International, Chemical and Engineering News, German Public Radio, and many others, January, 2016. Congratulations to former Braun group member Jinyun Liu! His image was selected as a Finalist of the 2016 SCS Science Image Challenge at the University of Illinois! C. Zhang, G.G. Cano, P.V. Braun, Linear and Fast Hydrogel Glucose Sensor Materials Enabled by Volume Resetting Agents, Advanced Materials, 26, 5678-5683 (2014). DOI: 10.1002/adma.201401710. 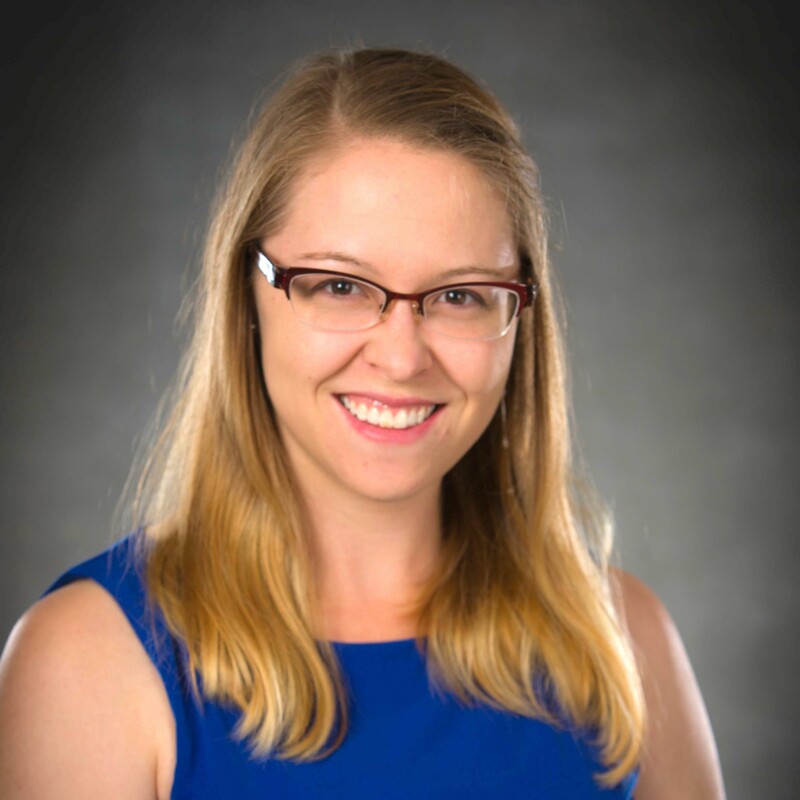 Congratulations to Katilin Tyler, recipient of a Mavis Future Faculty Fellowship! Congratulations to Chunjie Zhang, winner of the Materials Research Society Graduate Student Gold Award for his paper “Hydrogel Sensor Materials for Continuous Glucose Monitoring,” which was presented at the MRS Fall Meeting in Boston, MA. Congratulations to James Pikul, winner of the Materials Research Society Graduate Student Gold Award for his paper “High Power Primary Lithium Ion Micro Batteries,” which was presented at the MRS Fall Meeting in Boston, MA. E.C. Nelson, N. Dias, K. Bassett, S. Dunham, V. Verma, M. Miyake, P. Wiltzius, J. Rogers, J. Coleman, X. Li and P.V. Braun: Epitaxial growth of three-dimensionally architectured optoelectronic devices, Nature Materials (2011). 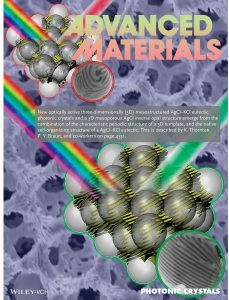 A. Radke, T. Gissibl, T. Klotzbucher, P. V. Braun and H. Giessen: Three-Dimensional Bi-Chiral Plasmonic Crystals Fabricated by Direct Laser Writing and Electroless Silver Plating, Advanced Materials, 23, 3018-3021 (2011). DOI: 10.1002/adma.201100543. Paul Braun is interviewed by the BBC – click to listen! 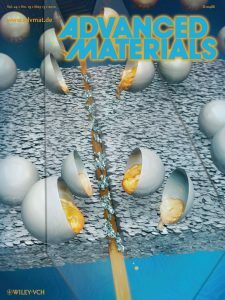 Podcast with Materials Today – click to listen! Dramatic reduction in corrosion of a steel plate coated with a self-healing coating (right) as compared to a conventional coating is demonstrated. Two samples were scratched and placed in 5% NaCl for 5 days. The background is an optical image (2× magnification), in the foreground is an SEM image of the scratch. In the self-healing sample, the scratch has almost completely self-healed, while in the control sample, the scratch remains all the way down to the substrate. Here we report the use of direct laser writing topattern porous 3D structures from photo-responsive colloidal building blocks. Upon 2-photon exposure, the colloids become highly attractive, enabling localized control of aggregation behavior. 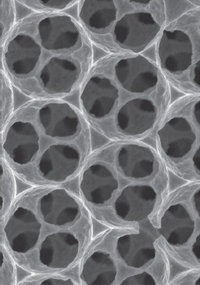 3D structures composed of porous walls are harvested by writing intoa colloidal sediment of these particles, followed by rinsing away unexposed colloidal species. Applications may include microfluidics, and studies of porous media, cellular growth and signaling, and colloidal physics. Cover art by Steven Eisenmann of the Beckman Institute VMIL. 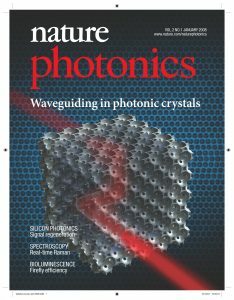 Photonic crystals, artificially engineered nanoscale structures that can manipulate the flow of light, show great promise for building sophisticated optical circuitry that can route, filter, store or suppress optical signals. However, fabricating such circuitry presents a great challenge as defects need to be carefully incorporated into the photonic-crystal structure with great precision. 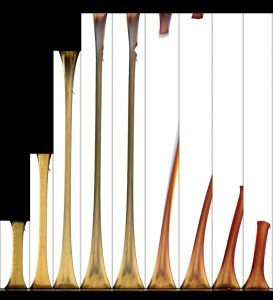 Although this has been accomplished for two-dimensional designs that confine light in a plane, it is still an ongoing challenge for so-called complete-bandgap materials, where the defects need to be embedded into a three-dimensional structure. In this issue, Paul Braun and colleagues report the introduction of defects into a silicon three-dimensional photonic crystal by using a technique called two-photon polymerization. The result is waveguides that guide near-infrared light around sharp corners. Jeong-Ho Park and Paul V. Braun: Coaxial Electrospinning of Self-Healing Coatings, Advanced Materials (2009). 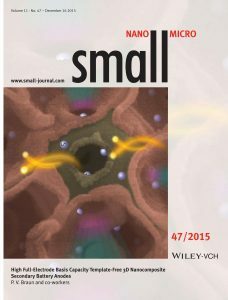 Mary M. Caruso, Stuart R. Schelkopf, Aaron C. Jackson, Alexandra M. Landry, Paul V. Braun and Jeffrey S. Moore: Microcapsules Containing Suspensions of Carbon Nanotubes, Journal of Materials Chemistry, 19, 6093 (2009). Jhy-Tsung Lee, Matthew C. George, Jeffrey S. Moore and Paul V. Braun: Multiphoton Writing of Three-Dimensional Fluidic Channels within a Porous Matrix, Journal of the American Chemical Society (2009). Soo Hyoun Cho, Scott R. White and Paul V. Braun: Self-Healing Polymer Coatings, Advanced Materials, 21, 645-649 (2009). Stephanie A. Rinne, Florencio García-Santamaría and Paul V. Braun : Embedded cavities and waveguides in three-dimensional silicon photonic crystals, Nature Photonics, 2, 52-56 (2008). X. Yu, Y.-J. Lee, R. Furstenberg, J. O. White, and P. V. Braun: Filling Fraction Dependent Properties of Inverse Opal Metallic Photonic Crystals, Advanced Materials, 19, 1689-1692 (2007). F. García-Santamaría, M. Xu, V. Lousse, S. Fan, P. V. Braun and J. 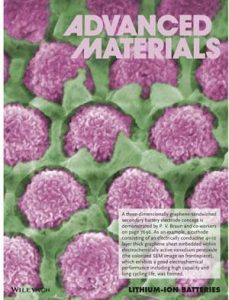 A. Lewis: Germanium Inverse Woodpile Structure with a large photonic band gap, Advanced Materials, 19, 1567-1570, 2007. 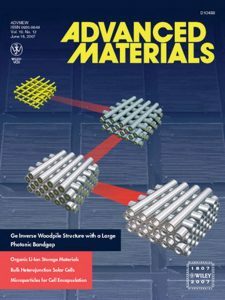 Researchers at the U. of I. have built an inverse woodpile structure of germanium, a material with a higher refractive index than silicon. 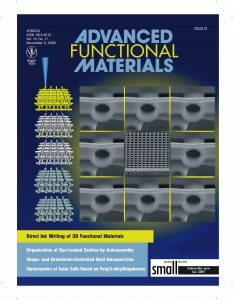 The direct ink writing of three-dimensional functional materials is detailed in the Feature Article by Lewis on p. 2193. The left side of the cover image displays schematic images that show the conversion of a direct-write polymer woodpile to a silicon hollow-woodpile structure. The 3 × 3 image matrix showcases the resulting silicon photonic crystal (center) surrounded by a higher-magnification view of a representative hollow silicon feature (ca. 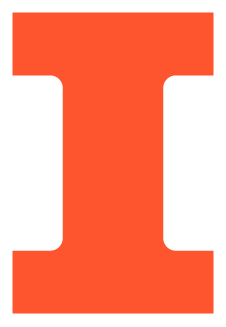 1 m in diameter). The figure was prepared by F. Garcia-Santamaria, G. M. Gratson, and P. V. Braun. 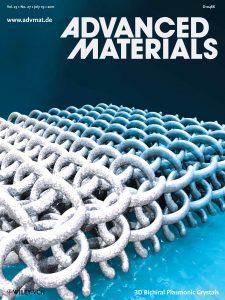 The ability to pattern materials in three dimensions is critical for several technological applications, including composites, microfluidics, photonics, and tissue engineering. Direct-write assembly allows one to design and rapidly fabricate materials in complex 3D shapes without the need for expensive tooling, dies, or lithographic masks. Here, recent advances in direct ink writing are reviewed with an emphasis on the push towards finer feature sizes. Opportunities and challenges associated with direct ink writing are also highlighted. S. H. Cho, S. R. White, and P. V. Braun: Self-healing Polymer Coatings, abstract A3.54, Materials Research Society Fall Meeting, Boston, MA, December 2006. Z. Ge, Y. Kang, T. A. Taton, P. V. Braun, and D. G. Cahill: Thermal transport in Au-core polymer-shell nanoparticles, Nano Letters, 5, 531-535 (2005). H. Liang, T. E. Angelini, J.Ho, P. V. Braun and G. C. L. Wong: Molecular imprinting of biomineralized CdS nanostructures: Crystallographic control using self-assembled DNA-membrane templates, Journal of the American Chemical Society, 125, 11786-11787 (2003). W. Lee, S. A. Pruzinsky, and P. V. Braun: Multi-photon polymerization of waveguide structures within three-dimensional photonic crystals, Advanced Materials, 14, 271-274 (2002).